Nearly one year after agreeing to merge in a bid to reinvent healthcare for Americans, CVS Health and Aetna sealed the deal on Wednesday, bringing together one of the nation's largest pharmacy chains and one of the largest health insurers. Their goal? The lofty aspiration of transforming healthcare delivery for the better. But the jury is still out on whether they'll accomplish that or leave employers and patients on the hook for higher healthcare costs. "Today marks the start of a new day in health care and a transformative moment for our company and our industry," CVS Health President and CEO Larry Merlo said in the announcement. "By delivering the combined capabilities of our two leading organizations, we will transform the consumer health experience and build healthier communities through a new innovative health care model that is local, easier to use, less expensive and puts consumers at the center of their care." The $70 billion merger scored approval from U.S. Justice Department antitrust enforcers and insurance regulators in 28 states, despite warnings from provider groups, patient advocates, economists and antitrust experts that the combination could harm competition and patients. On Monday, New York regulators became the last to sign off on the deal with conditions. Aetna will be a stand-alone unit within CVS and led by members of its current management team. Mark Bertolini will resign as Aetna CEO but will have a seat on CVS' board of directors. Some experts question if the conditions that states required of the companies before approving the deal will effectively mitigate any anticompetitive effects. But with the last regulatory hurdles cleared, CVS and Aetna will have a chance to make good on promises to fix some of healthcare's most persistent problems. "Is this going to be something that actually does something new that's innovative? Can these two companies come together in a way that they can do better things or do things less expensively without compromising quality or continuity of care? And you know that's just not clear yet," said Martin Gaynor, professor of economics and public policy at Carnegie Mellon University. The merger comes amid mounting frustration among employers and patients over rising medical and prescription drug costs and anger over the role that pharmacy benefit managers, such as CVS' own Caremark, play in sticker-shock drug costs. CVS and Aetna painted their combination as a solution to the U.S. healthcare system's shortcomings. The companies say they will offer better, cheaper, integrated healthcare. CVS walk-in clinics would become community healthcare hubs where pharmacists would manage patients' care and counsel them between primary-care visits. Combined funds and advanced analytics would allow them to tackle the social determinants of health and manage the care of chronically ill patients, where the bulk of healthcare spending lies. By year two, the companies expect the combination to yield savings of $750 million from streamlining administrative functions, negotiating better pricing and managing care more effectively. Experts who study healthcare consolidation don't buy these claims. In his forceful June testimony to California regulators, Wharton School professor of healthcare management Lawton Burns labeled them "hollow promises," noting that the companies have yet to detail how they would accomplish their goals. Burns doubted that CVS' retail clinics could effectively manage the care of chronically ill patients. He argued there's no consistent evidence that vertical integration reduces costs or improves quality. Likewise, Tim Greaney, a professor at University of California Hastings College of the Law, said he is skeptical the merger will produce benefits for consumers. While the Justice Department's requirement that Aetna divest its Medicare prescription drug business to WellCare Health Plans alleviated some anti-competition concerns, the deal still raises the possibility that the combined CVS-Aetna company would raise costs for Aetna's rival insurance companies that need PBM services or deny rival pharmacies access to Aetna members. Moreover, the combination deprives the increasingly consolidated PBM market of a potential competitor in Aetna. That's also the case with Cigna Corp.'s acquisition of the nation's largest PBM, Express Scripts, which is expected to close this year. UnitedHealth Group's OptumRx unit completes the triad of dominant PBMs that will have little incentive to offer competitive prices to smaller insurance rivals, Greaney said. "The concern there is we'll have an oligopoly along the lines of what we've seen in other markets like airlines—that we'll have less vigorous competition," he explained. In a statement, the AIDS Healthcare Foundation, a not-for-profit provider of treatment to people with HIV/AIDS, reiterated its concerns that the combined company will force patients to use CVS walk-in MinuteClinics in place of their personal physicians, or compel patients to use mail-order delivery for medications even when they need to interact with a pharmacist in person. The foundation further worried that competing pharmacies would be driven out of network and independent pharmacies out of business. In the announcement Wednesday, CVS responded to some critics' concerns by saying the combined company's products and services will be broadly available to patients regardless of their insurer, pharmacy or pharmacy benefit manager, while retail and specialty pharmacy and other services would continue to be available to other health plans. Aetna members will still be able to fill prescriptions at non-CVS pharmacies, it said. New York regulators who cleared the deal this week attempted to mitigate some anti-competition concerns by demanding CVS refrain from offering preferential pricing to Aetna. 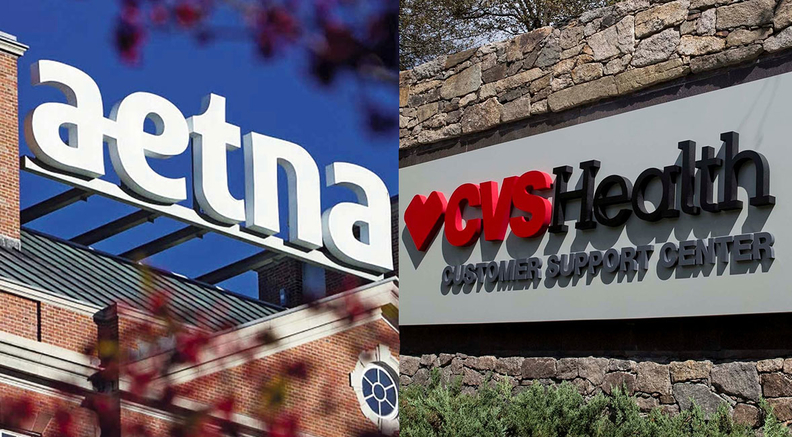 The state's Department of Financial Services said CVS-Aetna also agreed that its New York provider networks will maintain access to the same percentage of independent pharmacies before and after the merger for three years. The company must also annually report the pharmacy rebates Aetna receives and the amount returned to customers. New York and California regulators demanded the combined company also refrain from raising premiums to pay for the acquisition. The California Department of Managed Health Care further said CVS-Aetna must keep premium increases "to a minimum" for five years but didn't define a threshold for maximum premium hikes. But Gaynor questioned the effectiveness of these conditions. Behavioral and conduct conditions don't change the underlying incentives the companies may have to do things that harm competition, he said. It's also difficult to monitor and detect whether a company violates a condition. "Suppose Aetna raises premiums; how do you know it was due to the merger? It's not impossible to determine that but it's not as straightforward as saying, well, you raised premiums. And what about preferential pricing? These are big corporations, and so there are lots of ways to move money around that could have the same impact of preferential pricing but wouldn't be readily detectable," Gaynor said. Still, some experts hope the combined CVS and Aetna does disrupt the stagnant realm of care delivery. As an integrated company, it's possible that Aetna will have more power when negotiating prices from drug manufacturers or rebates from PBMs, said Raymond Brown, consulting firm Mercer's North American clinical pharmacy leader. Benefits should also arise from more information-sharing between the PBM and insurer, he said. He doubted the merger would add any transparency to the murky business of pharmacy benefit management, however. Already, CVS said it has begun to put the new healthcare model in place and will introduce new products and services in the coming months that will "target better, more efficient management of chronic disease using the networks, technology and the people of the combined company." CVS said it will offer services focused on self-management for patients' chronic conditions, nutritional and behavioral counseling, and assistance with durable medical equipment. It will also offer new preventive health screenings in high-risk communities to diagnose and treat chronic illnesses. Finally, CVS said it is developing programs, such as medication reviews, and expanding services and hours at its clinics to reduce medical costs and keep patients away from the hospital and emergency room.